3Spiral Wave Tab – New Tab Extension is the PUP that uses misleading techniques to prevent removal. Use Reimage to locate malicious components and get rid of them faster than with uninstall instructions. A full system scan blocks virus reappearance and prevents traffic to malicious domains. newtab.html page. The suspicious extension has some very shady permissions, such as read and change user’s bookmarks, as well as data on websites the user visits, and what is even more suspicious, it has the right to know victim’s email address! The shady extension attempts to force the user to use a fun-looking search engine that also provides weather forecasts on the same page. However, each of your search queries entered into this vague search tool will be transmitted to particular servers, as well as your browsing history, IP address, and similar information. 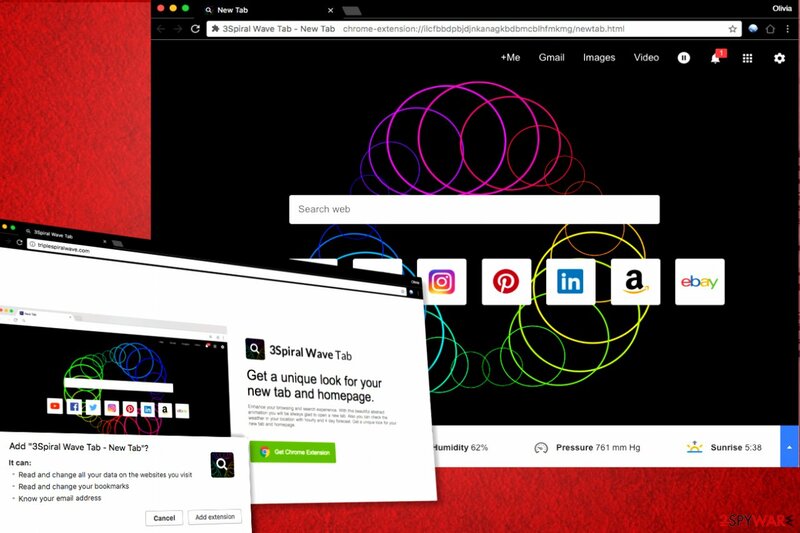 The suspicious 3Spiral Wave Tab – New Tab Extension virus seeks to track your activities in order to provide targeted ads to you. What is even worse is that the developers of this questionable extension might be selling collected data to third-parties. If you are a security-minded user and you’d prefer to keep aforementioned types of data to yourself, remove this questionable add-on using anti-spyware software like Reimage. Be extremely careful when using the described search engine because people tend to call it 3Spiral Wave Tab – New Tab Extension redirect virus not without reason. It seems that this shady program injects third-party links into search results in order to redirect the user to external pages that might be hazardous. 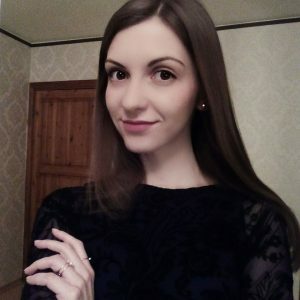 For instance, you might be forced to enter annoying sites that suggest participating in online lotteries, taking surveys, installing “useful” programs that can only slow down your computer or put your privacy at risk. To stay clear of such sites, remove 3Spiral Wave Tab – New Tab right now. If you do not want to use the program, we suggested earlier, follow the removal instructions that we added at the end of this post. Potentially unwanted programs that integrate sponsored content into websites you visit or those that change your browser’s settings are usually distributed using the same old technique known as software bundling. This technique allows software developers add less popular programs to more known software and distribute them together. During the installation of the main program, users have the possibility to drop off the unwanted additions, sadly, usually, users do not use this privilege and end up installing a bunch of unwanted programs on their computers. This often happens due to attempts to install the software as soon as possible. If you do not want to allow, such PUPs to hijack your computer, act wisely and modify software installation settings properly. We suggest choosing Custom or Advanced settings which allow deselecting unwanted additions. Please, do not trust Standard or Default settings because these contain permissions to install bundled software. 3Spiral Wave Tab - New Tab virus is a dangerous computer program that adds an extension to user's browser and starts causing redirects to a suspicious website with a search engine on it. Search results provided by this tool can be deceptive! 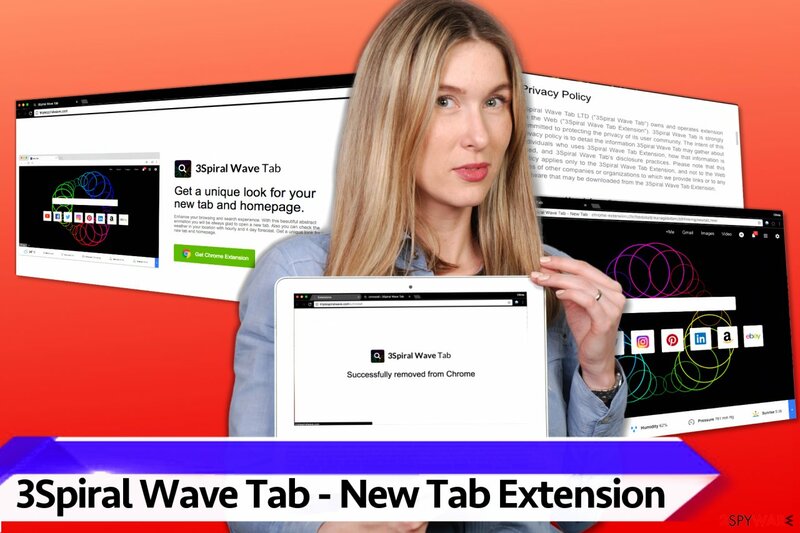 There are two methods that can help you to remove 3Spiral Wave Tab – New Tab Extension virus. The first one is considered to be more time-consuming because it requires studying browser hijacker removal guidelines and deleting 3Spiral Wave Tab’s components manually. The second option is using anti-spyware software for automatic 3Spiral Wave Tab – New Tab Extension removal. Choose whichever method looks best to you and start deleting the virtual pest right away. Here, look for 3Spiral Wave Tab – New Tab Extension or any other recently installed suspicious programs. Wait until you see Applications folder and look for 3Spiral Wave Tab – New Tab Extension or any other suspicious programs on it. Now right click on every of such entries and select Move to Trash. 3Spiral Wave Tab – New Tab. Here, select 3Spiral Wave Tab – New Tab Extension and other malicious plugins and select trash icon to delete these entries. Click Reset to confirm this action and complete 3Spiral Wave Tab – New Tab Extension removal. ^ Adam Levin. 5 Reasons You Shouldn't Give Your Email Out Like Candy. ABC News. Business News, Personal Finance and Money News. This entry was posted on 2017-06-02 at 07:15 and is filed under Stealing programs, Viruses. You can quickly scan the QR code with your mobile device and have 3Spiral Wave Tab – New Tab Extension virus manual removal instructions right in your pocket. How did you remove 3Spiral Wave Tab – New Tab Extension virus?